The black stamps exist in three types, the violet ones only in one type (corresponding to one of the types of the black stamps). All the black stamps are very rare, the violet ones are rare. 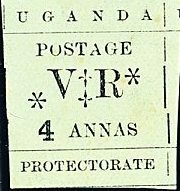 The above stamps were issued by Reverend E. Miller-Mengo (an English missionary). These stamps were always cancelled with a crayon as shown above. These stamps are not as rare as the preceding ones, but still very uncommon. 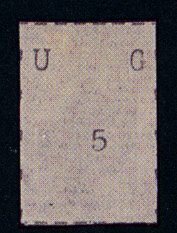 The stamps without overprint are uncommon, the ones with overprint rare to very rare. 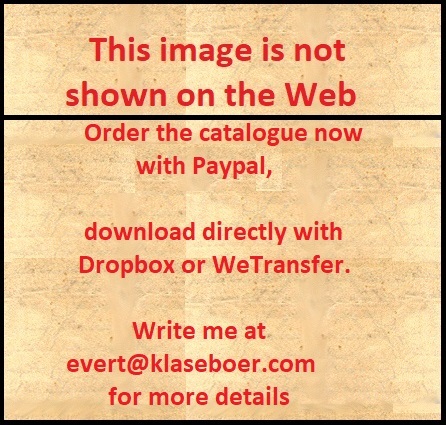 For the specialist, these stamps have watermark 'Crown CA' and are perforated 14. These stamps have watermark 'Multiple Script CA Crown'. The values 10, 20, 25, 50, 75 and 100 Pounds were mainly used fiscally. 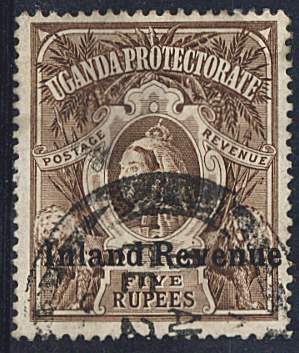 Many of these stamps exist with fiscal overprint 'Uganda Revenue' (two types of overprint). Also the overprint 'KENYA JUDICIAL' was printed on many values. 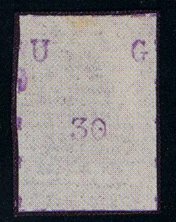 In 1934 a fiscal stamp with the portrait of King George V were issued with top-inscription 'KODI' and 'KENYA' below in the value 1 Sh orange and lilac (sorry, no picture available).